Heat oven to 350°F. Grease 12-cup fluted tube cake pan with shortening; lightly flour (or spray with baking spray with flour). In 1-quart saucepan, heat condensed milk and chocolate chips over medium-low heat, stirring occasionally, until chocolate is melted. Remove from heat; set aside. In medium bowl, mix flour, baking powder, baking soda, pumpkin pie spice and salt until blended; set aside. In large bowl, beat 1 1/2 cups butter, the granulated sugar and brown sugar with electric mixer on medium speed about 2 minutes or until well blended. Add eggs, one at a time, beating well after each addition. On low speed, beat in flour mixture in 3 additions alternately with pumpkin until well blended (batter will be thick). Spoon 2/3 of batter (about 5 cups) into pan, bringing batter up about 1 inch on tube and on outside edge of pan. Stir chocolate mixture; spoon into center of batter, being careful not to touch sides of pan. Spoon remaining cake batter (about 2 cups) over filling; smooth top. Bake 55 to 65 minutes or until toothpick inserted in center of cake comes out clean and center of crack is dry to touch. Cool cake in pan 15 minutes. Remove from pan to cooling rack. Cool completely, about 1 hour. Place cooled cake on serving plate. In 1-quart saucepan, heat 1/4 cup butter over medium heat, stirring occasionally, until golden brown. Pour browned butter into medium bowl; stir in powdered sugar, vanilla and milk, 1 tablespoon at a time, until spreadable (mixture will thicken as it cools). Let stand 1 to 2 minutes or until slightly cool; stir. Drizzle over cake. 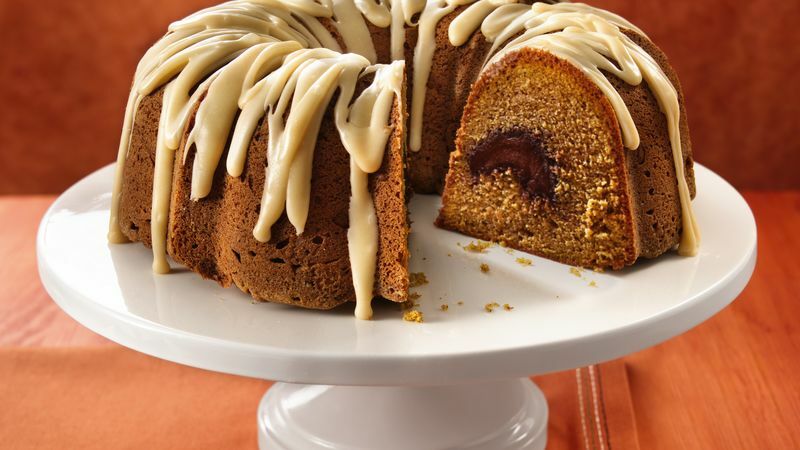 Be sure to use canned pumpkin, not pumpkin pie mix, for this yummy, incredible pound cake. Pumpkin pie mix contains sugar and spices--not just pumpkin.